Sunday’s two big games in the Premier League throw up contrasting challenges for the two Merseyside clubs, with Liverpool outsiders at home against a team they have a brilliant home record against (Manchester City), and Everton outsiders away against a team that history says will thump them. The history we are considering is the Premier League era, so the 23 years since the top division revamped in 1992-93, kick-starting the ‘monied era’ explained in greater detail here. It goes without saying that the circumstances in place 23 years ago have little bearing on what happens between teams now owned respectively by billionaires from Abu Dhabi, America and Uzbekistan (and by a millionaire from Lancs). But there remain some strong and consistent patterns of outcome in certain fixtures over time, for whatever reasons. 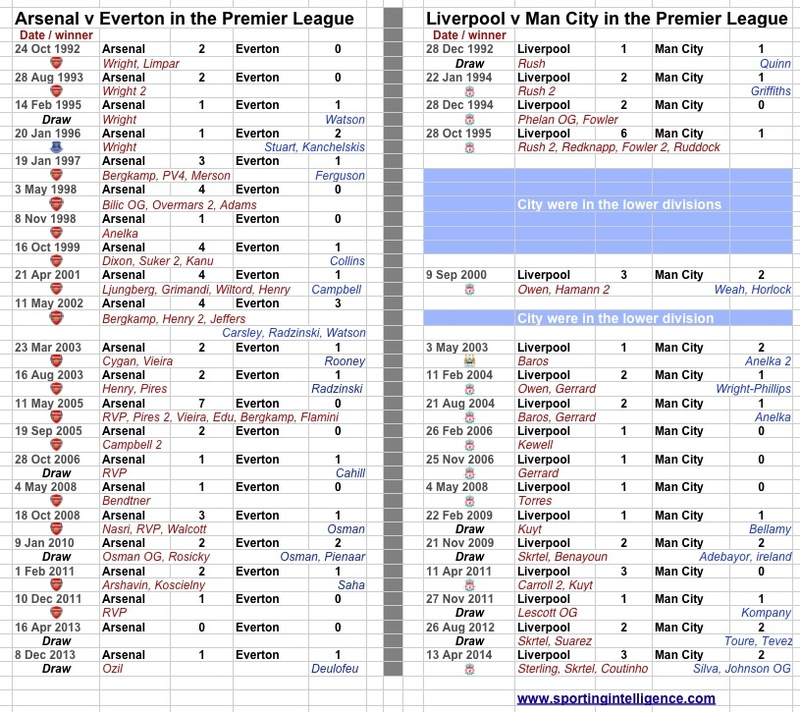 And whether we think they will have a bearing on what happens this weekend or not, it is worth noting statistically that Arsenal at home to Everton and Liverpool at home to City in the Premier League era have been remarkably one-sided contests. Arsenal have lost just once to Everton at home in the Premier League era. Once in 22 games. That’s just 4.5 per cent of the time. They have won 16 times from 22 games. That’s 73 per cent of the time. The other five games have been draws. Liverpool have also lost just once at home to Manchester City in the Premier League. Once in 17 games; there have been only 17 because City meandered for a period to the lower divisions. That’s a loss rate of below 6 per cent. They have won 11 of 17 games. That’s 65 per cent. The other five games have been draws. Nor have Liverpool seen a plunge in performance particularly since City were fortunate to come into money after Sheikh Mansour bought them in 2008. Their sole home defeat to City in the PL era was in May 2003. Everton have to go further back for their only PL win at Arsenal: 1996. Recent results have been getting closer for both Everton and City. Four of Everton’s five Premier League draws at Arsenal have come in their last eight visits (or in other words, half of their last eight visits have been draws) and four of Man City’s five Premier League draws at Anfield have come in their last six visits (or in other words, two-thirds of their last six visits have been draws). The bookmakers are expecting a home win for Arsenal and an away win for City. Premier League history says two home wins. Value in betting terms is found in two draws. But this is not a tipping site so draw your own conclusions and think instead on this: only once before in the Premier League have both fixtures come on the same day. That was 4 May 2008, and both games ended in single-goal wins for the home team. To get some idea of how the financial situations of these clubs have changed over time – and finance is a big influence in success in football – further reading and related articles spring from Sportingintelligence’s annual global sports salaries reports, linked here..